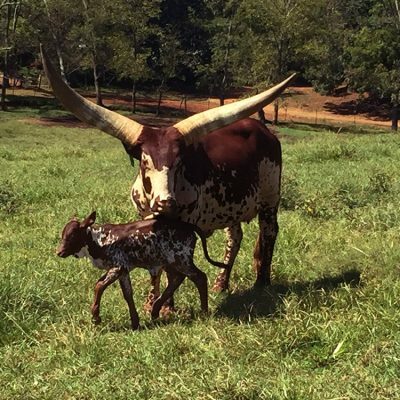 When I first came to this farm I was pretty familiar with bison and camels, but I had never seen African Watusi cattle. Color me shocked at these grand animals with massive horns both in length and diameter. Longhorn cattle might seem as if they could come close in weaponry, yet these cattle blow them straight out of the water. Needless to say I was a bit cautious around them at first, with scary visions in my head of me skewered on a giant horn, but then I met Maranda. Maranda is a mature cow and her horns are quite impressive. She is dark red and white and speckled all over and has a gentle, knowing gaze in her golden eyes. Maranda will walk right up to our tour trailer and stick her head in as far as those giant horns will let her and eat range cubes out of your hand, reaching out with a tongue as spotted as her nose. She will stand and let me scratch her between those horns, which I assume is a pretty hard place for her to reach, and half close her eyes while I am doing so. I look forward to seeing her every day and always go out of my way to slip her a treat or a loving pat when we venture into the pasture. Terry, our gruff farmhand who loves these animals more than most people he has ever met, teases me and calls her ‘my’ cow, which I don’t mind one bit. We all manage to find our favorites after a while. One day not too long ago, Terry came running into the farmhouse where I was working to clean up before the next day’s tour and yelled, “You’re a grandmother!” and then proceeded to tell me that Maranda had calved that morning. Of course I ran out to the Kubota, a four-wheel drive, all-terrain vehicle that we use to get out into the fields, to go check. Sure enough, she was standing in the field with a beautiful female calf by her side, just as speckled and lovely as her mother. The calf tottered about on her new long legs to follow Maranda back to the herd, and when they stopped, the calf took a nice long drink, ensuring that she will be strong and healthy. I’ve been watching that little calf grow over the past few weeks. We are all still debating on her name and since we are all pretty stubborn she may end up with three or four different ones before too long. She has put on weight and playfully jumps about in the early fall sunshine with the other calves until they all lay down and nap together in the afternoons with their mothers standing guard about them. There really is nothing more peaceful than a field of cows and calves with their swishing tails and the sounds of tearing grass and chewing, except that this scene is also punctuated with the occasional “clonk” of two massive horns as grazing neighbors accidentally bump each other. Honestly, I think it makes the whole scene better.